Allorecognition is the ability to distinguish between one's own tissues and those of another member of one's species. Colonial invertebrates—animals like sponges, corals, anemones, hydroids, bryozoans, and ascidians—are capable of allorecognition based purely on cell-cell contact. This ability is important because most colonial invertebrates live as encrustations on marine surfaces and grow in size by asexually propagating their own tissues to spread across their substrate. As they grow, colonies frequently encounter one another. Contact between compatible colonies results in coexistence. In some taxa, colonies actually fuse to form a single, physiologically integrated colony. In contrast, contact between incompatible colonies results in rejection, with colonies often aggressively fighting for space. In every species studied to date, allorecognition is controlled by genetic systems encoding highly polymorphic loci. Levels of allelic variation at allorecognition loci match or exceed that found at the MHC in vertebrates or self-incompatibility loci in plants. This extreme polymorphism ensures that colonies only fuse with themselves or very close relatives, and reject unrelated conspecifics. Thus, allorecognition systems allow colonies to compete with each other for space—perhaps the most limited resource in benthic marine environments—without the risk of accidentally competing with close relatives or themselves as they grow around three dimensional surfaces or regrow into contact after fragmenting. ﻿Correctly distinguishing between self and non-self is doubly important for many colonial invertebrates because they risk stem cell parasitism every time they fuse with a conspecific. This is because these species maintain a pluripotent stem cell lineage capable of differentiating into germ cells throughout the life of the colony. These stem cell lineages circulate freely throughout the colonies. Thus, fusion allows these stem cell lineages to compete with each other for access to the germline. Losing this battle is, from a fitness standpoint, as good as being dead. Thus, allorecognition systems mitigate the risk of stem cell parasitism by restricting fusion to self and close kin. Two compatible Hydractinia colonies that have grown into contact and fused. Incompatible colonies of the bryozoan, Calpensia nobilis. 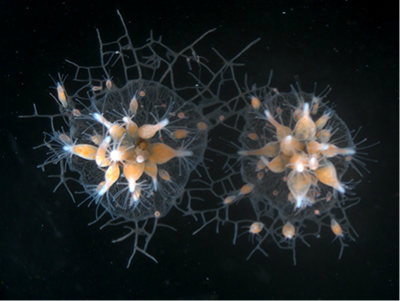 Fusing colonies of the ascidian, Botryllus schlosseri.